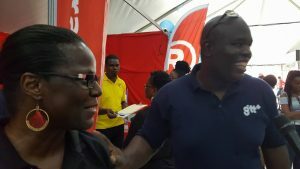 GTT’s CEO, Justin Nedd and an official of Radio Shack at the GTT-sponsored ‘Blaze’ Expo held at the Providence Stadium. The Guyana Telephone and Telegraph Company (GTT) on Saturday said it has begun rolling out a US$25 million fibre-optic system to offer blazing fast Internet service, while assuring that the company is not violating intellectual property laws by providing movies and other video content through its network. “We have all the clearance from our lawyers and I think we’ve got very good lawyers who ensure that I don’t go and do rogue type stuff,” GTT Chief Executive Officer, Justin Nedd said when asked by Demerara Waves Online News how the company is guarding against intellectual property violations. He said the introduction of high speed data through fibre optic cables has nothing to do with the Public Utilities Commission’s (PUC) recent approval of landline rates, and he shrugged off questions about whether it was because Digicel (Guyana) Limited has begun installing fibre optic cables. “In any market there are competitors and we believe at GTT- and we are very positive- that we will win,” he said. Nedd declined to say whether the telecommunications provider would be losing money initially on its investment as a result of the provision of Voice Over Internet Protocol (VOIP) phones, opting only to say that the fibre-optic system is an investment in the future. “We invest for the long-term because if we look at things in a very short-term manner, I could charge everybody a million dollars per service but then I would be out of service because people just can’t afford it,” he said. He explained the reason that GTT took so long between running a submarine fibre-optic cable to Guyana at a cost of US$30 million in 2010 and providing high-speed internet via fibre-optic cable in 2017. “It takes some time to really get to understand the market, get to understand the advancement in technology and all the external factors,” he said. The GTT boss said his company has already begun partnering with several companies to provide Internet-driven services such as hundreds of buffer-free movie and news channels, a secured payment system and remote security and surveillance systems. He said there is also opportunity for creators to partner with GTT to provide content. The speeds are 5 megabits per second, 20 megabits per second and 50 megabits per second. He hinged the expansion of the fibre-optic blazing high speed Internet to other areas based on demand. “We are building this out and much of this is success pace so we an overwhelming response, there is really reason for us not to go to other places,” he said.